It was revealed a few weeks ago that the NUS would be making far-reaching cuts to address a £3 million deficit and keep the organisation afloat. These cuts, as we understand it, are set to be most acutely felt in the NUS’ democratic sections: the sections that are directly accountable to the student membership. Within this, the NUS’ liberation campaigns are set to be hard hit, with rumours of abolition of full time officers (FTOs) that represent certain marginalised groups as well as a gutting of the campaigning budgets available to these campaigns. All of this is being discussed with no chance for input from ordinary NUS members. These reforms effectively represent a gutting of everything that we, as the left, are concerned about within NUS. They are likely to leave NUS as little more than a glorified think-tank run by unaccountable bureaucrats, which would; in all likelihood, abet further marketization of the education sector. NUS as it is currently, despite having policy towards free education, helps facilitate further privatisation and marketization by the government. It does not take much in the way of imagination to see the direction this would go in once accountability is stripped back from its already bare-bones condition. 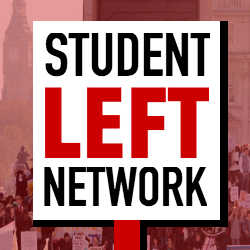 The Student Left Network (SLN) are fighting for a mass membership, political, campaigning NUS. NUS has the ability to lead coordinated, nationwide campaigns through student unions across the country, linking up and building on student activism on campuses. We are a broad coalition of student activists involved in rent strikes, divestment campaigns, student-worker solidarity and campaigns for properly funded mental health services – we want to bring these struggles into NUS and transform it into a fighting, political union of students. If the NUS left hopes to have any chance of defending and expanding what’s left of the NUS’ active, campaigning arms, we must work together to defend our democracy and liberation campaigns and unite around a set of shared political demands. The Student Left Network’s unity charter1 lays out a positive case for what the student left should be fighting for and the methods by which winning these fights will be made possible, including a democratisation of the NUS and Student Unions. We want to radically reset the culture on the NUS left. If we are to have a chance of winning this fight, we must organise around a clear set of shared political demands. We need a culture of cooperation and unity in action on the central political demands where we agree, and of open discussion and debate where we have political differences. The question must be asked, as it so often is historically: which side are you on? In this case, the student left must either rally around the campaign to stop the gutting of NUS democracy and liberation, or stand by and do nothing. SLN is calling for a vote of no confidence in Shakira Martin to stop the antidemocratic cuts. We can have no confidence in a President who allows drastic cuts to democracy and liberation to be made with no say from student members. If the motion of no confidence passes at 25 Student Unions, an extraordinary conference will be called, where the SLN will run a left candidate for President to challenge Martin. This conference should be used as a stand by the left to call for an alternative vision for the future of NUS. The SLN is also running an activist slate for NUS Conference 2019, for a campaigning union fighting for the welfare of its students and to transform wider society, supporting and facilitating activism on the ground. We will support and not run against left candidates who endorse the aims of the left unity charter and join the campaign to save NUS democracy and liberation.